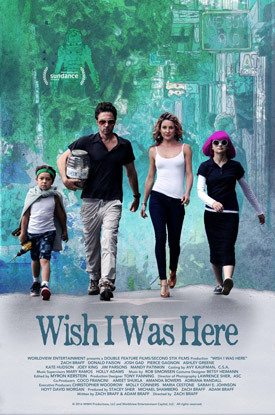 Zach Braff, Kate Hudson and Joey King star in the comedy-drama Wish I Was Here. Watch the movie trailer and view the movie poster below. In Zach Braff’s followup to his indie breakout hit ‘Garden State’, Aidan Bloom (Braff), a 30-something man arrives at a major crossroads that pushes him to examine his life, career, and his family. MPAA Rating: (R) for language and some sexual content. “Wish I Was Here” is the story of Aidan Bloom, a struggling actor, father and husband, who at 35 is still trying to find his identity; a purpose for his life. He winds up trying to home school his two children when his father can no longer afford to pay for private education and the only available public school is on its last legs. Through teaching them about life his way, Aidan gradually discovers some of the parts of himself he couldn’t find.